Arts as an integral part of our Murihiku/ Southland community. This is Arts Murihiku’s aim. Arts to be part of our everyday lives to add richness and vibrancy. What do you get when you marry arts with sport? Lots more fun for everyone. Believe it or not arts and sports are already inextricably intertwined – it’s just that we may not realise it. Can you imagine powering your way through a spin class or box-fit class without music?The hypnotic beat keeps you going. At the end, you feel somewhat relieved, perhaps a little smug and slightly or very sweaty. What it would feel it would feel like without music- somewhat of a grind I would think. 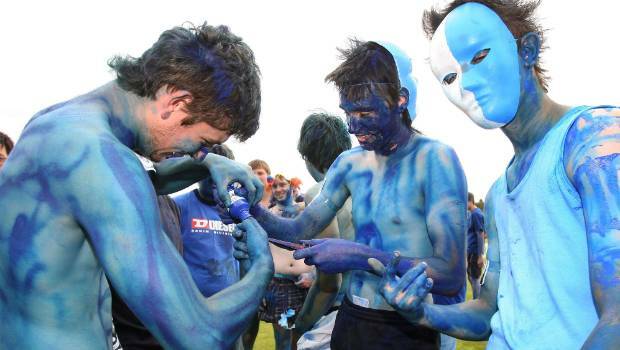 Naked Highlanders rugby players? This may have been the preference for some people rather than the team wearing lime green jerseys. It has to be said that these did cause some controversy. This is another example of arts and design interacting with sport – perhaps some would say unsuccessfully. The Tour of Southland is an iconic event in the local and national sporting calendar. Thousands of people follow this event. There is a banner competition for school children to support their favourite team or rider. What more could we do within our communities to add more art to this wonderful occasion? Some random cycle themed art or colourful messages on the road to encourage cyclists. Just remember be very wary of traffic and have a lookout! What about incorporating more public art within our walk ways? The estuary track and the Waihopai flood banks are perfect canvases for this. Imagine Phil King, John Wishart, Johnny Penisula and Phil Newbury sculptures placed along these paths, it would be absolute magic. The play of glass, steel and wood in this magnificent environment would be spectacular. Even better what about sculptures within the estuary. Their beauty exposed within the comings and goings of the tides. Invercargill is a flat city and cycling is an easy way to get from A to B. Wonderfully artistic bike stands is a way to bring the arts and leisure together. Bike stands in the shape of a tree, fish or Invercargill spelt out in large letters. We have many spectacular heritage buildings in our province. Using digital media to display visual art on them is yet another way to incorporate art into lives. Corporate Rowing and Cycling are all popular events for businesses to be involved in which build team spirit and are lots of fun. It would be great to have an arts equivalent. A corporate throw down, creating a sculpture out of natural materials or a poetry slam are other alternatives. The successful White Night which was part of the Southland Festival of the Arts, provided an opportunity for up and coming performers and those who are more established to share their talents with appreciative audiences. Some people who were involved would like to see this happen more than once a year – what are your thoughts? There are lots of wonderful community art initiatives in our province. Waikaia has Lodge 223 www.thelodge223.co.nz/, its own pop-up picture theatre. Once a month, locals gather together to view an arthouse film. Kiwiana edible treats are included in the price. Sometimes there are Eskimo pies or Jaffas, but there is always a cup of tea and some home baking at the end. This is just one example, of the arts being an integral part of a community. I am sure that there are many others. Arts are already embedded in our daily lives and add richness to them. We need to keep giving our creatives and makers a platform to share their work. To value and encourage the contribution they make to our community. Our makers and creators add richness, diversity and beauty to humanity. How do you believe we all can work together to ensure that art is an integral part of our local community?